I promised myself that if I ever had kids I’d teach them to be minimalists. A few toys and no more. That way they’d be able to use their imagination!! They’d have one or two go to toys and let their minds run wild becoming geniuses. Then I had children and realized why people were willing to let their homes becomes a landfill of children’s recreational devices. They need peace and quiet at any price. I don’t know what the cost of keeping my 7 month old sons quiet is in the long term. Maybe everything we’ve bought to distract them even for just a few moments has corrupted the imagination I had once thought I’d champion. It’s possible that my selfish need for 5 minutes of serenity on a daily basis has deprived the world of a cure for some disease that Arthur or Charles would have found. A disease that takes thousands of lives on a yearly basis that will continue because I needed a few moments on facebook without the crying and wailing of two infants surrounding me. I carry a lot of burden on my shoulders. My quest to keep these kids entertained (and quiet) has turned my house into what I once mocked. It’s Christmas Eve and I realize it’s only going to get worse in the next 24 hours. There will be a glut of new devices to fill my already overstuffed home and it won’t be pretty. It already isn’t. If you live nearby feel free to drop by tomorrow. I just don’t know where I’ll put you. I suppose you could sit and chill here. Here’s my advice though. If you wind up sitting in this area claim a few toys and a space. This area fills up quick and there’s a rough justice that happens inside these walls. It can be Thunderdome, where two babies enter but only one baby leaves. You might find a vacant spot but it’s not very relaxing. It’s a 5 x 5 x 8 Rikers Island. If you wind up here find the toughest baby you see and beat it up. It’s your only way to get the respect you’ll need. If it’s a relaxing area you’re looking for then here’s an ideal spot. Not a better place to unwind than this seat and the one right next to it, located just south of the play area. Swing back and forth to lilting tunes that will fill your head and you sleep off a big meal. You may even find a pacifier in there somewhere which is even better than a tooth pick. Just make sure you’re under eleven pounds. Of course if you want to come over and burn some calories after a big meal here is the best spot to hang out in my house. The bouncy seat area is centered in the hub of the house, in the living room right in front of the TVs. It’s where you can jump up and down repeatedly while watching a full slate of holiday football games. Also, if the pacifier is jolted out of your mouth every 17 seconds there’s no need to worry. Just cry a little but and there’s a guy who feels duty bound to put it back in your mouth. The only problem is there’s a long waiting line for these choice seats and you’ll need to have very skinny legs. These are the three areas you’ll have to squirm by before you even get close enough to greet me and my wife if you drop by. But we’ll be delighted to scream Merry Christmas and throw a few cookies at you from 20 feet away and maybe even squirt some egg nod in your general direction through a super soaker. That’s a quick breakdown of the seating arrangements here at Chateau Hurley. My wife and I can probably squeeze two people on the coach with us as long as they don’t mind a dirty look from the dog. When tomorrow comes we’ll be moving one or more of these areas into our bedroom to make way for new play areas to keep the boys satisfied. Because that’s what it’s all about. 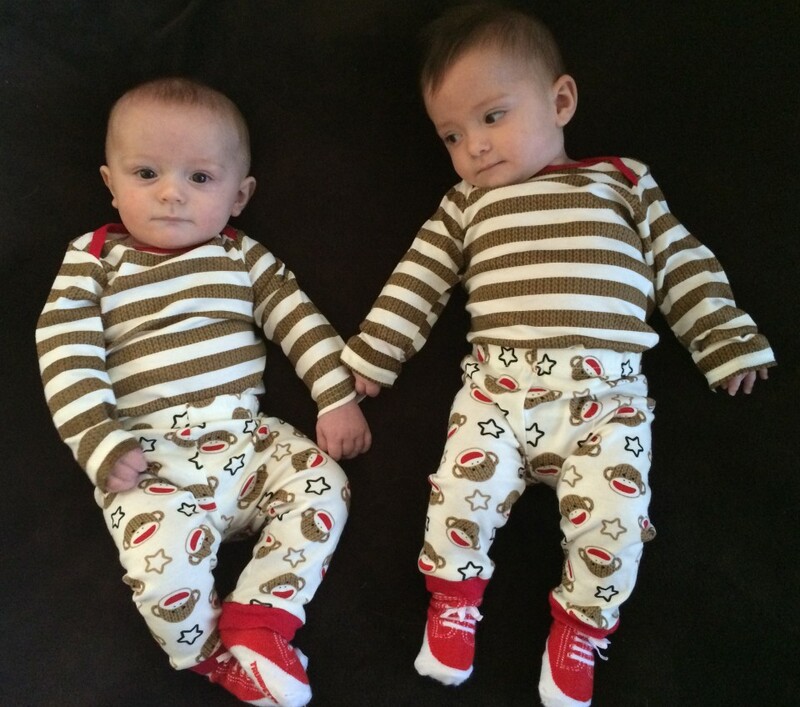 Misery takes it’s form in many ways but none more terrifying than two unhappy infant sons. There’s only one other seat left in the joint. And it’s off limits. I know having this place to myself is only temporary but it’s where I have my most cathartic moments. I’ve laughed in here. I’ve wept in here. I’ve gotten lost in thought in here. And I know the holidays are about giving, but this place in mine and mine alone…for at least another two months. December 18 – Least favorite is Arthur. The Sound of Music sing a long was on the TV. I’ve always been proud I could carry a tune. Arthur clearly believes I have an inflated ego. At least that’s what his cries while I sang say to me. Everyone’s a critic. December 19 – Least favorite is Arthur. We had some professional photos taken of the boys for the holiday. It doesn’t matter what either of them look like when the photo is snapped. Charles always looks great and Arthur always has his mouth hanging open as if he’s had too much cough syrup. He’s not going to be a cover model. December 20 – Least Favorite is Charles. Have you ever had a tough time getting to sleep and at 3am just wished there was someone you could talk to? Charles doesn’t have to wish this at all. He has loud conversations at 3am all the time. Conversations that demand an audience or else. December 21 – Least Favorite is Charles. Pooping all over an outfit you’ve been wearing for just five minutes will almost always win you LFC honors. December 22 – Least Favorite is Charles. Solid food are a new things for the boys and Charles has a head that moves like a lazy susan. There’s no telling how much food even gets inside him during these sessions. I really hope that Neil is visited by three ghosts tonight and the Christmas Present one swings by my place so they can see me pathetically blogging and change my fortunes.